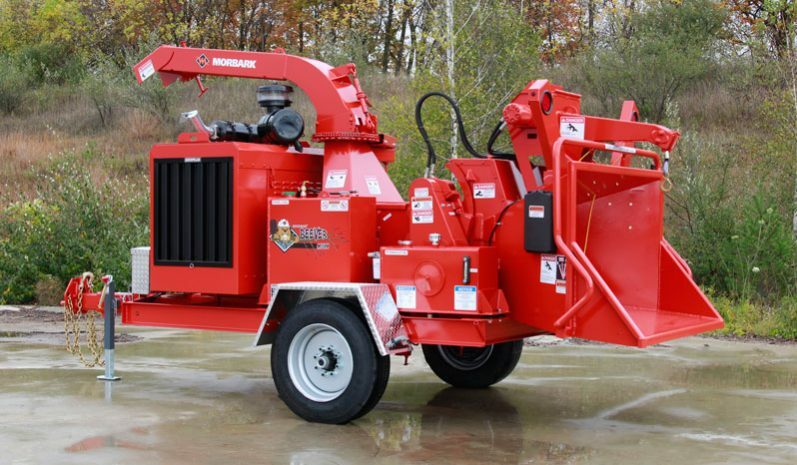 Beever™ M15RX Brush Chipper is the ideal unit for residential tree services, utility line clearing, vegetation management, maintenance contractors and municipalities. This high-capacity chipper is now on a compact, lighter weight design platform. The 8.2 lb., 6-inch channel frame rails increase structural strength while maintaining low unit weight. With the powerful TorqMax™ top feed wheel compression system – the 32.3ci hydraulic motor generates more than 3,400 ft. lbs. of material pulling force – and 18-inch diameter single top feed wheel with straight flow-through infeed design, the M15RX provides powerful and efficient chipping action. The patented chambered air impeller system increases chip throwing velocity and reduces dust and material blowback out the infeed to pack more into the chip truck. Like all Morbark equipment, the M15RX is a long-lasting, durable machine backed by a world-class parts and service support team. Length 16 ft. 5 in. Height 8 ft. 10 in. Fuel Tank Capacity 32 gal. The powerful TorqMax™ top feed wheel compression system generates more than 3,400 ft. lbs. of material pulling force. The wide infeed opening with 18-inch diameter single top feed wheel and straight flow-through infeed easily climbs over material, reduces drag and increases chipping efficiency. The 8.2 lb., 6-inch channel frame rails with 2 x 6-inch tubular steel frame with cross bracing increases structural strength while maintaining low unit weight. 360° manual crank swivel discharge with adjustable height puts chips right where they’re needed without removing the Beever from the tow vehicle.